You want to hear something really awkward? The other day at our office, two of our team members showed up wearing this vibrant costume to work. On the same day. Oops; awwwwkward. No one knew what to say or do, so we all just filled up our coffees and sat our desks without saying anything, oddly pretending that nothing had happened. Let’s just say it was definitely an elephant in the room. We’re telling you this information because we heard through the grapevine that you are one of the few wonderful folks who thrive on awkward situations. You love, for instance, when you’ve said a heartfelt goodbye to a friend and then keep walking in the same direction (ack! )—so weird. You adore a pregnant pause, or when someone appears to be waving at you and you wave back enthusiastically, only to realize they were really waving at the person behind you. Or remember when you called your teacher “Mom” back in first grade? Hilarious! Well, friend, no outfit finds the joy in the uncomfortable like this Adult Pink Elephant Costume, so we think it’s just perfect for you and your quirky sense of humor. Your pals will be tickled by the vibrant pink hue of this ensemble, not to mention envious of your gigantic ears and cozy jumpsuit. 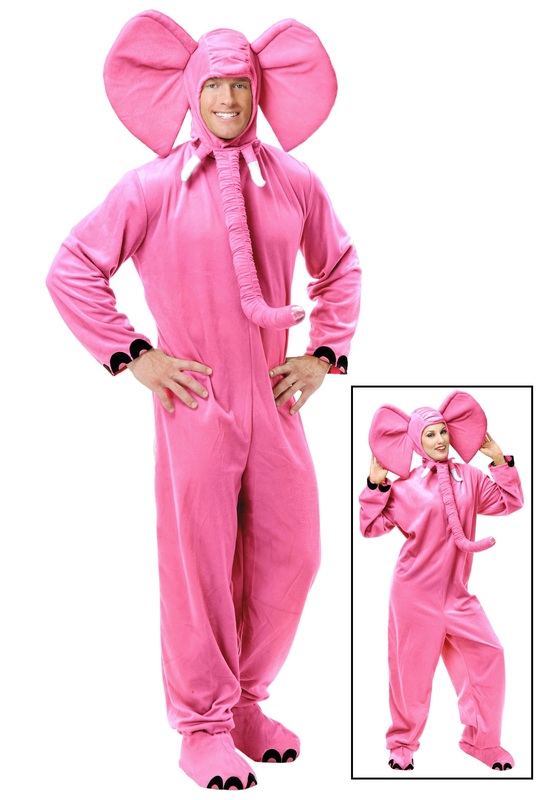 This outfit’s hood secures under your chin, so that when you finally realize you’ve been calling that acquaintance the wrong name all night, you can make a beeline for the door without so much as ruffling a tusk.